Interpreting management broadly, the journal welcomes innovative research based articles in all areas of management. Articles with an in-depth analysis on various social, political, economic, environmental and other factors with relevance to theory, policy or implementation in business, social or public sectors are welcomed by the journal. Publication in the journal is at the sole discretion of its Editorial Board. Details of categories of submission are mentioned below. Research papers must be original and relevant to management theory and practice. Articles must contain a thorough understanding of the relevant literature and must contribute to the existing body of research. Empirical articles should have an appropriate methodology section and relate their findings to the existing literature. Methodological articles, well justified by data or theoretical models, must show how they further existing theory in a given field. The journal aims at advancing existing thought and/or practices in the relevant field and hence publishes articles that endeavour to be original and insightful. The manuscript could be roughly about 6000-10000 words. This section provides a forum for scholars with different perspectives to come together and discuss an issue related to management theory and practice. In this section we invite papers that will be critiqued and discussed by a set of scholars regarding a particular interpretation in management theory and practice. As a symposium, this section will carry one lead article and 2-3 discussions on the nodal paper. We expect the lead article to be limited to 6000-8000 words. The critiques should be limited to 3000 words. This forum is an opportunity to participate in scholarly debates and knowledge contests which are critical for expanding the boundaries of management theory and practice. We invite proposal and articles that fit within the scope of this section. 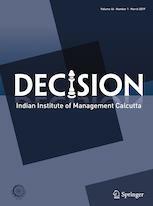 This section will carry case studies that provide a rich description of the business or societal contexts of managerial decision-making. We encourage authors to use primary research to bring a different perspectives on contending stakeholders around a managerial context. Here, cases need not be confined to large businesses. We encourage case based approach in diverse contexts that can include a conflict over natural resources, legislative or policy change, socio-technical embedding of financial markets, an ethnographic understanding of relations at a workplace, or a network of informal market actors. Book reviews are by invitation only.